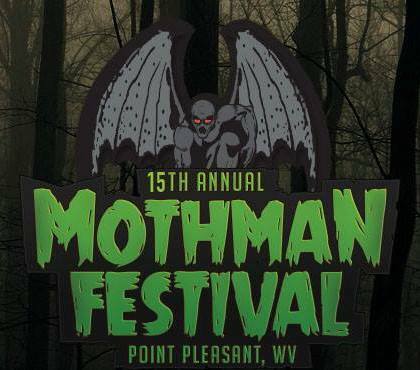 POINT PLEASANT, W.Va. —Discussions about UFO’s and Bigfoot are on the rise and thousands of people are set to descend on Point Pleasant, all of which points to one phenomena — the annual Mothman Festival. Wamsley’s formula has seemed to work. He explained, attracting that many people to Point Pleasant exposes them to local merchants and attractions, including local museums, Riverfront Park, Tu-Endie-Wei State Park, Krodel Park and Fort Randolph, to name a few. The initial interest invites those tourists to go beyond Mothman and downtown, to places like the West Virginia State Farm Museum, TNT, and the general “history and mystery” of the area. Wamsley said though visitors may initially visit due to their interest in Mothman, they return because of all that the area has to offer. “We’re all very excited about the future of the festival,” Wamsley added, explaining the latest estimates on this year’s crowd are anywhere from 5,000 to 8,000 people. He praised Mayor Brian Billings and other city officials and workers for assisting with the logistics of the growing festival. Wamsley’s daughter, Ashley Wamsley-Watts, who also helps organize the festival, said the event is “part comic-con and part street fair” which is what makes it unique. That uniqueness has reached around the world with this year’s festival visitors coming from Norway, Dublin, Ireland and New Zealand — and that’s just the ones who have confirmed. Visitors will also be coming form Alaska, California, New York, Florida, all along the East Coast and from the Midwest, with more than 20,000 saying they’re interested in attending and 5,000 who have confirmed they are attending on the festival’s Facebook page, Wamsley-Watts said. A guide to the Mothman Festival appears below, with information on times, dates, locations and even parking tips. The 15th annual Mothman Festival is this Saturday and Sunday in downtown Point Pleasant with ground zero being at Fourth Street at the Mothman Statue. Events will stretch from Sixth Street to Tu-Endie-Wei State Park. Festival hours are 10 a.m. to 9 p.m. Saturday and 10 a.m. to 5 p.m. Sunday. Admission is free. In addition, there is a festival “kickstarter” event offered this Friday at 7 p.m. at the State Theater when the Ohio Nightstalkers group will give a free presentation entitled “Mothman meets Bigfoot.” This will include exhibiting photos and audio evidence that suggest Bigfoot exists in southeast Ohio. The “kickstarter” event was added to entertain those who arrive early for the festival. Each year, the mayor of Point Pleasant gathers at the Mothman Statue at 10 a.m. Saturday to give a few, brief remarks and welcomes visitors to the festival. Wamsley typically says a few words as well. Immediately following, there are also plans for an impromptu, “monstrous” motorcade escorting this year’s festival celebrities to their meet-and-greet tent. Each year the Mothman Festival welcomes special celebrities to meet with fans and this year is no different. The cast of “Mountain Monsters” will be meeting with fans under a canopy next to the Point Pleasant Post Office. The tentative schedule for the meet-and-greet is from 10 a.m. to 8 p.m. Saturday and 10 a.m. to 5 p.m. Sunday. “Mountain Monsters” is a documentary television series on Destination America. It premiered June 22, 2013, and began its fourth season on Jan. 23, 2016. Cosplay consists of fans dressed as their favorite characters and the Mothman Festival welcomes them with open arms. This year will mark the return of the popular “Ghostbusters” and their 30-foot Stay Puft Marshmallow Man. The Ghostbusters actually raise money to buy toys for children in West Virginia at Christmas. The Ghostbusters should be at the festival both days, organizers said. New this year to the festival, will be fans dressed as characters from the hit television show “Supernatural.” These dedicated fans, who are coming all the way from Tennessee, will be bringing a replica of the Chevy Impala from the show for photos. Often found wandering the streets during the festival are the Men In Black, Captain America, characters from Star Wars and the elusive Bigfoot. Also, the star of the festival, Mothman, will be making multiple appearances for photo ops. The Mothman costume was redesigned a couple of years ago by the man who gave Marshall University’s Marco a new look. Bus tours, hayrides, tram tours and horse-drawn carriage rides will all be offered for a fee at this year’s festival. Bus tours will be given of the TNT area, which will include a guide speaking about the history of the area and will allow tourists to step off the bus into the TNT area to examine an igloo. Tours for Saturday are already sold out, though openings for Sunday remain. Tickets can be purchased during the festival at the State Theater on a first come, first served basis, cash only. The tour bus seats 55. Buses load at Sixth Street near the steps of the Mason County Courthouse. Tickets for hayrides of the TNT area which begin at the West Virginia State Farm Museum, can be purchased at the information tent at the festival, as can tram tours which feature a historic, guided ride through downtown Point Pleasant. The info tent is near the Mothman Statue on Fourth Street. The horse-drawn carriage rides will feature a stroll through downtown Point Pleasant with tickets purchased at the carriage stop, located near the heart of the action on Main Street in downtown in Point Pleasant. All speakers will appear at the State Theater on Main Street, presenting on a variety of topics, including Mothman, “mythical” creatures, the paranormal and more. Saturday’s speakers: 10 a.m., Robert Robinson; 11 a.m., Chad Lambert; noon, Susan Sheppard; 1 p.m., Rosemary E. Guiley; 2 p.m., Joedy Cook; 3 p.m., Stan Gordon; 4 p.m., Fred Saluga; 5 p.m., Bill Brock; 6 p.m., Ken Gerhard; 7 p.m., Nick Redfern; 8 p.m., Loren Coleman. Sunday’s speakers: noon, John and Tim Frick; 1 p.m., Sherri Brake; 2 p.m., Cameron Jones; 3 p.m., round table discussion and Q & A; 4 p.m., George Dudding. Saturday’s bands appearing at Riverfront Park: 11 a.m., Creek Don’t Rise; 1 p.m., 5:42; 3 p.m., Pop Friction; 5 p.m., Sodbusters; 7 p.m., StillWater. Also, at 8 p.m. Saturday at the West Virginia State Farm Museum, the Mothman Band. The River City Cloggers return to perform at noon and 4 p.m. on Main Street. Sunday’s bands appearing at Riverfront Park: 11 a.m., Duane Albert and The Area 51 Band; 1 p.m. Ultrasound; 3 p.m., Warcreek Mafia. Also, at 1 p.m. Sunday, Fish Fisher will perform in front of the Mothman Statue on Fourth Street. Race starts at 8 a.m. Saturday, check-in is at the Mothman Museum on Main Street, runners/walkers will then walk to the start line at 8th Street and Main Street. Registration the day of the race is at 7 a.m., also in front of the museum or pre-register online at Tri-State Racer by following this link. There are already 160 registered with more expected on race day, according to organizers. The First Mothman Festival Pretty Baby Contest will be Saturday at Tu-Endie-Wei State Park. Registration is at 10 a.m. Contest starts at 11 a.m. Age divisions for baby boys and girls are 0-5 months, 6-11 months, 12-17 months, and 18-23 months. A first-, second-, and third-place winner will be awarded in each age group. Winners receive medallions. Dress child in casual wear. A People’s Choice Award will also be given for one boy and girl. Votes are $1. Entry fee is $15. Bring your own seating. Contest takes place on the steps of the monument. The Hillbilly Zip Line returns and will be located near the State Theater. Also, there are tentative plans to bring in a large inflatable obstacle course for the kids and place it near the Mason County Courthouse. Also, popular face painter Jody Rife will be providing Mothman and assorted face designs at Riverfront Park. Organizers are promising a “foodies” paradise with diverse and eclectic offerings, including a food truck all the way from Florida which cooks specialized noodles, and other vendors with offerings like “Moth Wings” (chicken wings), “Mothball Subs” as well as barbecue stands, “Mothman flavored” popcorn, “Motheroni” Rolls” (pepperoni rolls) and UFDoughs (a pastry dish) and much more. Eclectic merchandise vendors will once again be returning, with everything from action figures, to toy creators, jewellery, books, clothing and more. The epicenter/location for the food and merchandise vendors is typically at Fourth Street and Riverfront Park. Visitors can also shop at several downtown merchants while in town for that Point Pleasant-specific item. This year, additional parking will be provided by the City of Point Pleasant at Krodel Park. The fee is $5 per car and visitors will have the option of walking to the festival on a marked trail or riding a tram/shuttle at no extra cost. The shuttle will deliver visitors to Sixth Street with drops offs and pickups at the Silver Bridge Memorial. Parking has been an issue as the festival has grown. Though many local businesses don’t mind visitors parking in their lots, some do. It’s always best to ask for permission to error on the side of caution. Also, there is street parking in the city, as well county parking lots near the court house and library. Saturday and Sunday, there will be street closures downtown from Sixth Street to Tu-Endie-Wei State Park. However, on Saturday, Fifth Street will be open to local traffic only until noon, to allow alleyway access to the post office as well as Peoples Bank. When these businesses close for the day on Saturday, the street will then be closed to all. There’s an app for everything, including the Mothman Festival. The app, available through YAPP, allows visitors to post pics from the festival, schedule and track events and gives push button notifications. It will include a festival map and be a place to connect with social media and, “all the info you need at your fingertips,” Wamsley-Watts said. Tip: Don’t use Facebook to sign in to the app – create a new account using the app.